I hope you enjoyed last week’s story on Foodie Friday where our kitchen took on the task of being a test kitchen for a very special wedding day treat for the wedding attendants and out of town guests at our son and daughter-in-law’s wedding. The adventure led us to choosing three deliciously, moist muffins to give as gifts. All were created to have a special treat surprise on the inside. I really couldn’t tell you which one became my favorite. I enjoyed them all. Many people reported to us they absolutely loved each of the muffins, but today’s recipe seemed to be on the top of the list as the favorite. In the picture posted today, the muffins are as follows. The Carrot Cake Muffin with Cream Cheese in on the far left. 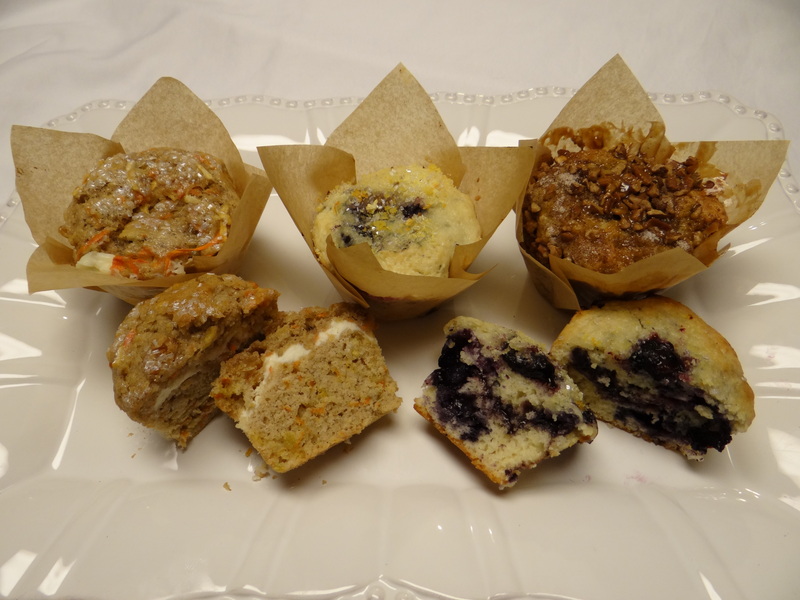 The Citrus Topped Blueberry Muffin is in the middle. The Banana Caramel Muffin is on the far right. Unfortunately, I didn’t get a picture of the Banana Caramel muffin sliced in half. Left-overs were gobbled up too fast…ha ha!! What, those are crumbs on my mouth!!??!! 1. Line 12 standard size (or 6 jumbo size) muffin cups with paper baking cups. In a small bowl, mix pecans, 2 Tbsp. sugar and 1 tsp. cinnamon. 2. In a large mixing bowl, beat the cream cheese, softened butter, and 2/3 cup sugar with an electric mixer until well combined. Add egg, and beat well. Beat in the mashed banana and vanilla until combined. 3. In another bowl, combine the flour, baking powder, baking soda and salt Add to the banana mixture, beating on low speed until just combined. 4. Stir in 1/4 cup of the pecan mixture. Spoon 1 heaping table spoon of muffin mixture (cover entire bottom) into the baking cup. Add 1 well rounded tsp. of caramel topping over the batter in each cup. Top with remaining batter. Drizzle a little melted butter on top of each muffin. Sprinkle the remaining pecan mixture on top of melted butter. 5. Bake at 375 degrees F. for 18-20 minutes or until a toothpick inserted in center comes out clean. Cool for about 5 minutes. Remove muffin cups from baking pan and continue cooling on a wire rack. You can always drizzle more caramel sauce on them when they have completely cooled. Yields 12 standard size muffins.